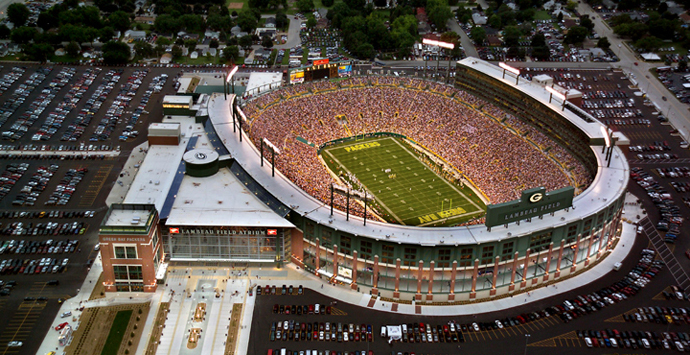 The Green Bay Packers are renovating Lambeau Field without spending a dime of taxpayer dollars. When compared to the $498 million fleecing Minnesota taxpayers just endured, the $6.4 million Virginia taxpayers will be spending — thanks to Republican Governor Bob McDonnell — on improvements to the Redskins’ training facilities looks like small potatoes. Regardless of size, both the Vikings’ new stadium and the Redskins “deal” feature the same credulous acceptance of imaginary threats, insider dealing and Babbitt boosterism that undermines the democratic process and contributes to voter alienation. In Minnesota Democrat Gov. Mark Dayton and NFL Commissioner Roger Goodell used the threat of a Vikings move to California to put pressure on legislators. In Virginia you’d have thought Irsay Moving & Storage had trucks idling in the parking lot, ready to whisk the Redskins away if the state didn’t pony up to renovate facilities that supposedly didn’t compare with other NFL franchises. Why do politicians fall for this horse hockey? I’ve heard better rationalizations from my teenagers. Evidently Minnesota politicians haven’t been keeping up with demographic trends. In LA they do like football, only it’s spelled “Fútbol” and they don’t wear helmets. Besides, LA used to have an NFL team, but it moved and the city survived. The Redskins organization isn’t moving because it has over 15 years left on the FedEx Field lease. But what about team headquarters and practice facilities? What are the alternatives? There’s Maryland, where the income tax rate is 55 percent higher than Virginia’s, and Prince Georges County where the last county executive is in prison. A higher tax climate and a lower ethical climate, what’s not to like? Don’t forget the District. Its income tax rate is also 55 percent higher and two council members have been convicted of crimes in the past year. But DC is also the home of Councilman Mary Cheh (D–I Know What’s Best) the woman who intends to mandate the color of DC taxicabs. There is also the “Native American” question that’s always on the fringes of Redskin Nation. In Massachusetts we have Democrat Elizabeth Warren who’s running for the US Senate and claiming to be 1/32nd Cherokee because she has high cheekbones. I don’t suppose it has escaped the notice of Redskins brain trust that the first three letters of Commissar Mary’s last name are also the first three letters of “Cherokee,” making her last name three–quarters Indian. How long do they think the team will be based in DC before Ms. Cheh decides the nickname “Redskins” is racist? There is a better chance the US Park Service move the burial location of Gen. Thomas J. Jackson’s left arm, than there is of the ‘Skins moving in this decade. Then there’s the backroom element of these travesties. In Minnesota the legislature essentially overturned a 1997 Minneapolis ordinance requiring a referendum if the city agreed to spend more than $10 million on a professional sports facility. They rightfully assumed city voters would take a dim view of throwing money at out–of–state sports plutocrats. Republican members in the House of Delegates also felt Virginia taxpayers would take a dim view of giving tax dollars to out–of–state sports plutocrats. They twice told Gov. McDonnell the House would not approve spending the money. This put the governor in a box. Dwight Schar is a minority owner of the Redskins and since 2009 has contributed $165,000 to McDonnell and his political organization. This kind of money gets your phone calls returned. One has to assume Schar was interested in enlisting the governor’s help. McDonnell could have told Dwight that he tried twice with the legislature and was rebuffed, but he would continue to help with Richmond and Loudoun County. Statistics bandied about by ‘Skins boosters claim the team supports 1,832 jobs “directly and indirectly” and generates “nearly $200 million in economic activity.” These numbers sound suspiciously like the Keynesian multiplier figures used for Obama’s government spending that has brought so much prosperity to us all. An “investment” generates a return; this money is a subsidy that will not result in anything the state does not already have. Virginia’s low taxes and business climate should have been all the incentive the team needed, unless it suffers from Buffett’s disease. Thanks to Gov. McDonnell’s leadership, an business that wasn’t going anywhere in the first place has decided to stay. A team that is named after Washington, D.C. and plays its games in Maryland will continue to wash its jocks in Old Virginny. This entry was posted in Government Spending, Humor and tagged business development, Gov. Bob McDonnell, Minnesota Vikings, taxes, Washington Redskins, wasteful spending by michaelshannon. Bookmark the permalink.